My one year blog anniversary has finally arrived. I have to admit that some of my early posts were pretty cringe worthy, since I didn't really know what I was doing. But I continued partly because blogging is addictive, and I've enjoyed visiting and sharing my projects with all of you. I don't have a lot of posts under my blogging belt yet, but as I've learned how to create more appealing vignettes and sharing the beauty of our region, I'm finally getting there. It has been a journey, but a fulfilling one so far. I started making cards in the late 90's, and I think cardmaking was reaching its peak then. 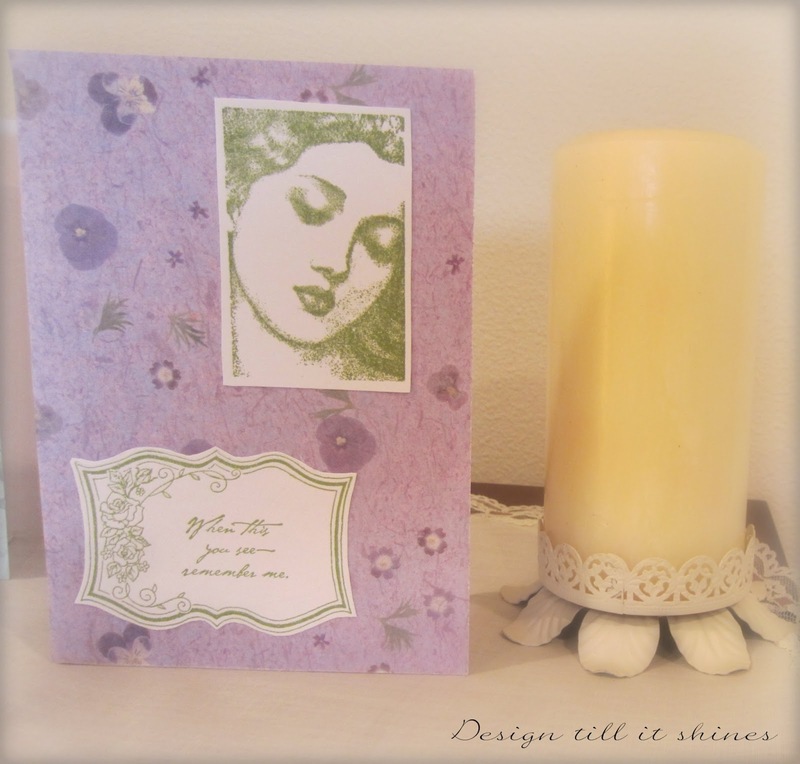 I stepped away from making cards and pursued other things, but the interest was always there so I started again when I began blogging. On to the giveaway. 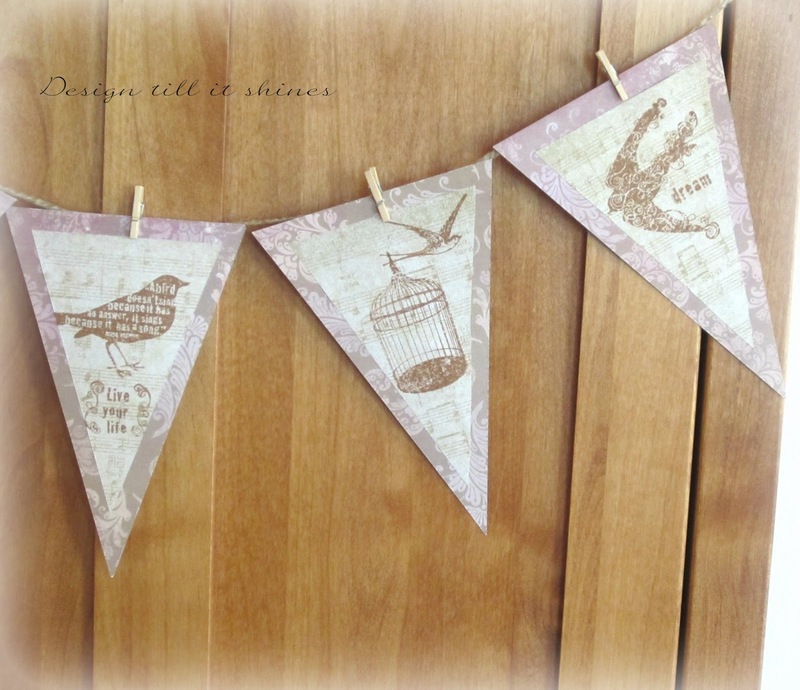 I've created two vintage cards and a bird themed banner. The cards have a common theme and use scrapbook paper for the front and stamped images. 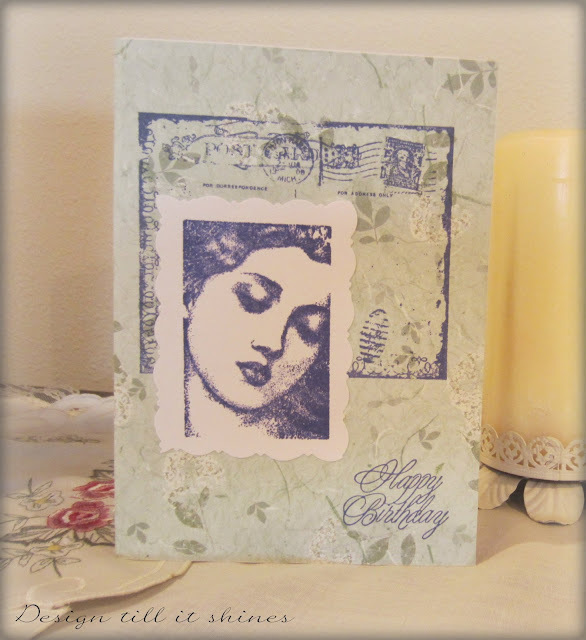 I love my lady in repose stamp so I used her and added my other images. These are 5X7 cards and would be lovely framed as well. I tend to keep my designs simple because I like a somewhat uncluttered style. I also like a quick and simple craft that makes a statement. The birthday card has green floral background paper attached to a plain white card, the lady image and postcard are in deep blue. The other one is an any occasion card with a lavender floral paper background. 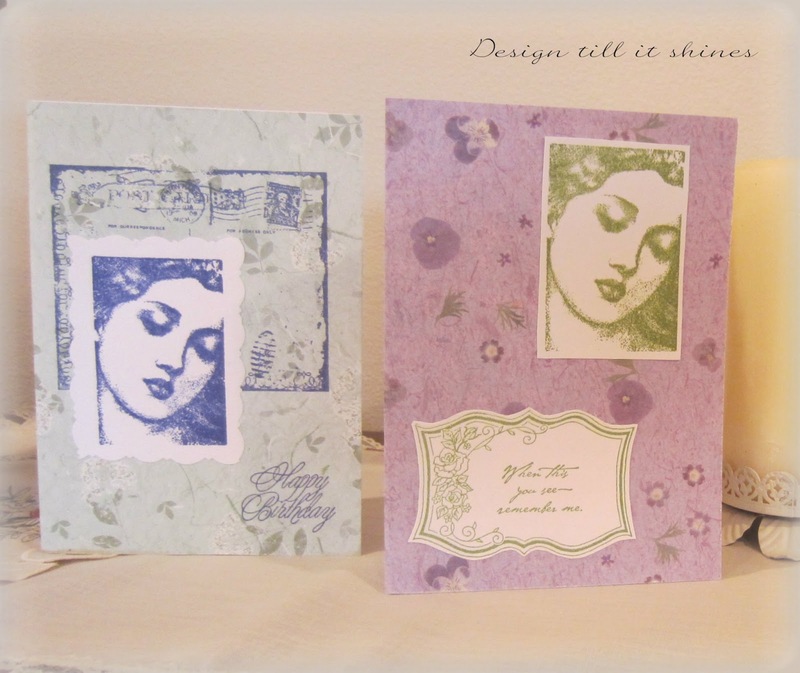 The lady and floral image are stamped in a light green. In case you can't read the words they say~ When this you see remember me. and the inside is blank except for the vintage button stamp I added. Both cards come with envelopes. 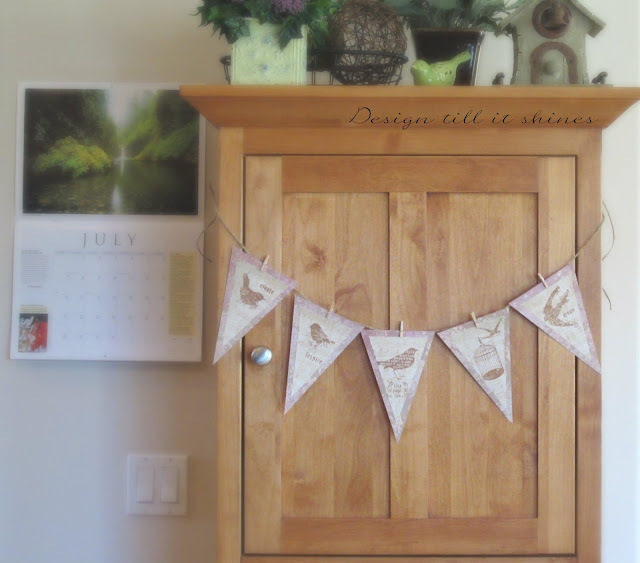 I make banners so often it seems that I'm getting banner burn out, but there are so many ways to decorate them that I wanted to create one for my giveaway. 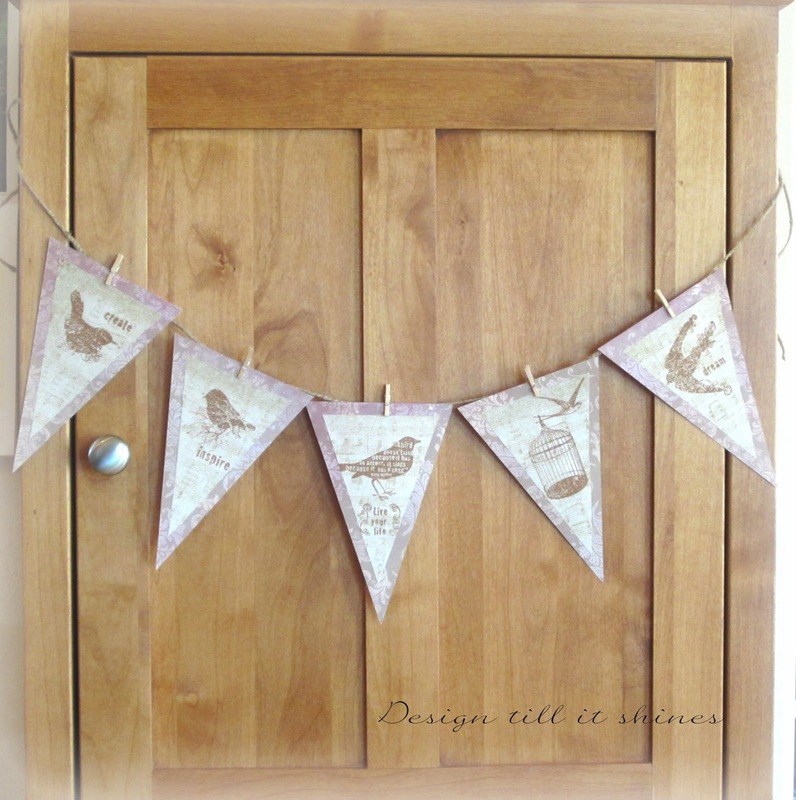 This banner has a bird theme and is done in sepia tones with some added pink on the background paper. It's on a jute string about 50 inches long and attached with mini clothespins. The lighting wasn't good when I took these pics, because the banner is a little more colorful than it shows here. The colors are muted and faded somewhat. I have it hanging on my pantry and I think it would look pretty against any small piece of furniture or in your craft room. It might work for a small mantel as well. Simply put together, I layered some decorative music paper onto my brocade background. 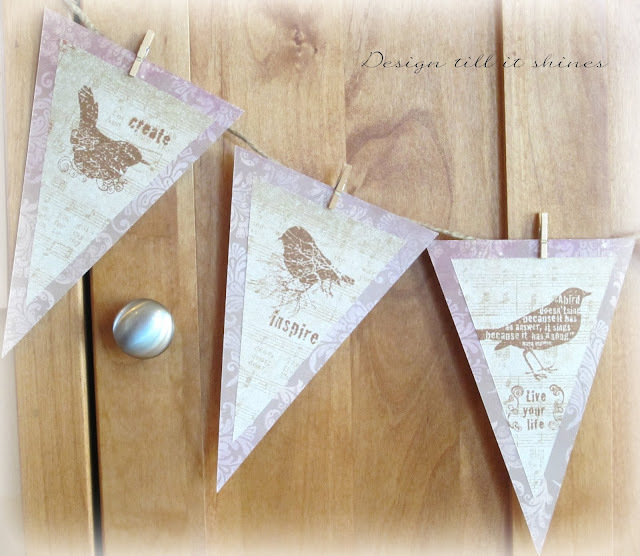 I added my bird stamp images and some inspiring words. I haven't made a banner in sepia before so I'll probably make more similar to this one. I love the vintage look of it and hope you will enjoy it too. I've made it very simple to enter. Leave me a comment and let me know you are following me on GFC and Bloglovin' and I'll follow you back. Each follow will count as one entry. You can also send me an email and let me know your are following as well. I'm always looking for new followers, so I hope you will join in and enter. Current followers let me know you have entered as well. I still use GFC to follow blogs, I never used the reader, because I follow along with my blog list on my dashboard. Of course GFC will be phased out at some time, so follow along on Bloglovin' as well so I can keep track of you! I'll be adding new ways to follow sometime in the future. Entries will close on July 30th and I'll announce the winner on the 31st! The giveaway has ended! Thanks for stopping by and entering! I follow you on GFC. Congratulations on your blog anniversary!! I'm a follower and follow you on my blog reading list, So far so good with that. Because it only shows part of the post it causes me to go to the blog each time and therefore it's much easier to comment. Your cards are quite nicel I enjoy making cards as well. I love the postage theme you have to some of them. And I enjoyed your previous post on lavendar. Nice photos! Hi! I just found you thru 'No Minimalist Here' block party and am now a follower thru Bloglovin'. I just adore your bunting...and am looking forward to strolling thru your first year. Congratulations! I follow on GFC and would love to be entered in your giveaway. Your creations are beautiful and I enjoy your blog very much. I like GFC for following too and I hope it stays; it makes following and catching up on posts so easy. Your giveaway items are gorgeous! I am a follower on GFC, and Blovlovin', and would love to be entered in your giveaway! Congratulations on your blogaversary! Your cards and banner are lovely, very creative. I'm already a GFC follower and now following on Bloglovin. I was already following you on Google and on Bloglovin. Your cards and banners are lovely. I know what you mean about the early blogs. I began blogging in January 2012. My early pictures were horrible and I have learned so much about collage and topics over the last year and a half. Jamie Martin - jamielovesweeping@gmail.com = new follower by GFC. Jamie Leigh Martin = Blogloving.